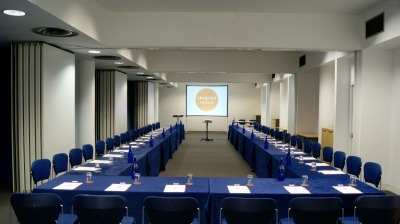 London’s Congress Centre has announced plans to turn the Congress Suites, currently four interconnecting meeting rooms, into one large space as part of a summer programme of refurbishment at the central London venue, which is due to take place between 20th July and 10th September 2017. The Congress Suites are on the same level as Congress Hall, the venue’s largest room that accommodates 500 theatre style (850 standing), and are frequently used as breakout areas for events taking place in the Hall. However, in recent years an increasing number of clients have been booking the Congress Suites to hold exhibitions and by breaking down the partitions between the rooms and incorporating the adjacent corridor, the floor area will increase significantly from 143 sqm to 191 sqm. During the renovation work, it is hoped that the original 1950s’ parquet flooring in the listed building, currently covered by carpet, can be restored and two sets of glazed double doors will be added to access the new space, with colour changeable LED lighting installed throughout the room. Congress Centre’s summer renovation programme also includes refurbishing the extensive women’s and men’s washroom facilities on the same level to increase capacity and install new LED lighting, as well as installing new LED lights in Congress Hall.